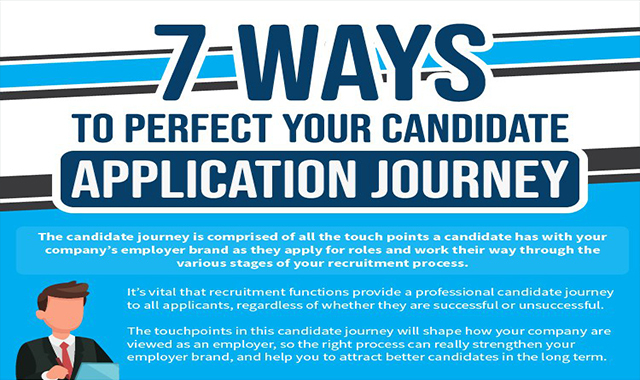 7 Ways to Perfect Your Candidate Application Journey #infographic ~ Visualistan '+g+"
As a candidate progresses through your job application process, their candidate journey is made up of all the touch points they have with your organisation. This candidate application journey will play a big part in how your brand is viewed as an employer, because it’s often the only experience that a person will have with your employer brand. A pleasurable and seamless journey will have candidates singing your praises and eager to get on board, but an inefficient and impersonal one, will send them running in the other direction and warning their friends to do the same. So, it’s important that you map out your candidate journey and ensure that it runs smoothly, providing a positive experience for all applicants. From the moment, a candidate applies for a role with your organisation, right through to the formal job offer, you need to reflect a professional and personable image.